Home / Adviart Blog / Take 5. Take 5. This adviarter picked the shell for its larger surface area. The advice, take 5 is a mix of words and numbers. The 5 representing 5 minutes each day to take back and reflect on the current moment. The adviarter recommending that I stop to smell the roses and enjoy the moment (especially when so many neat things are around the corner). He advised me to enjoy the moment. The advairter used blue because it is his favorite color. He used orange because it stands out–represents fun and boldness. The adviarter also signed the shell. 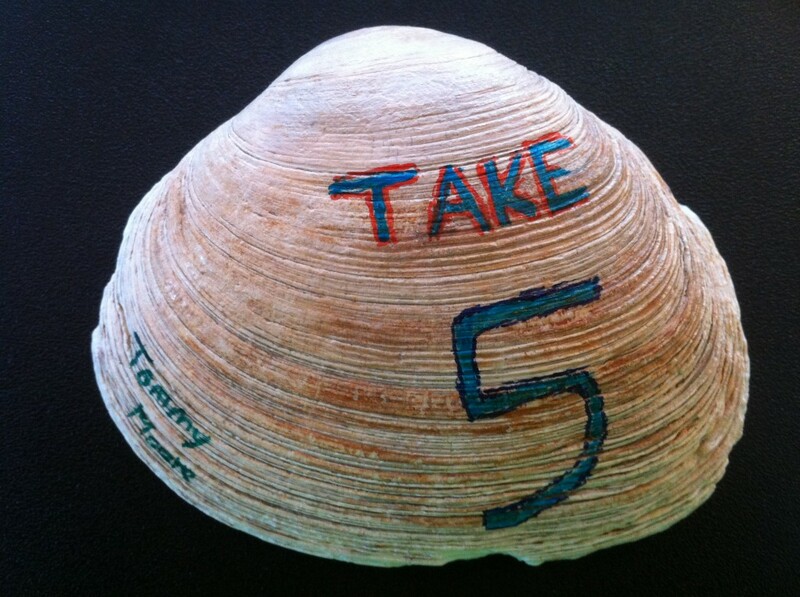 Take 5 came as a result of many conversations on entrepreneurship and life. After talking through how authentic people can be in both their personal and professional lives towards others, completing the wheel of life diagram, and talking shop about issues with both of our entrepreneurial pursuits–the idea of taking 5 came out. When we have drive, energy, and enthousiasm to move forward, how do we balance it with the present? How do we ensure that we embrace each day no matter what exciting or challenging opportunities are around the corner? Take 5 also reflects the very minimal commitment we can make each day to stop and reflect. 5 minutes can even seem like a long time depending on the day. However, when I think about this–I see a similar theme emerging from other adviart–Discipline, DISCIPLINE. So do you take 5 each day?